The gluten-free market has been significantly expanding lately thanks to the growing interest in gluten-free products that doesn’t lie as much in problems connected to the celiac disease but rather in health-concerned nutritional choices. Storci is well aware of how these events unfold and is a reference point for those determined and competent fresh pasta producers who are going to approach this market, thanks to our automatic tortellini forming machine by Cavallini and the cooperation with Molino Grassi. Food sector professionals crowded our stand to see our gluten-free tortellino with their own eyes and we were glad for them to try it with a great range of sauces, from “ragu” to cream and cheese, so that they could better savour the delicacy of this product since no-glut presently means quality and taste. 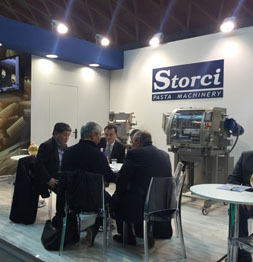 Silvio Valesi, Storci spa Sales Manager: “We are extremely pleased with the great turn-out and the interest shown in our tortellini forming machine displayed at the fair. We got many requests of info and quotations also for our full range of products: dry pasta, fresh pasta, cous cous, instant pasta and ready meals”.